We recommend two different water purification systems. The first is the 2Pure H20 Water System, which is a state of art, under-the-counter water purifier. And the second is the Berkey® Purification Systems. To learn about the Berkey® options, click here. Both are excellent systems. Read on to learn which option is best for you. In addition to a water purification unit to provide clean, pure water for drinking and cooking, we highly recommend a whole house carbon filtration system to remove chloramines (chlorine + ammonia) from water throughout the home. Learn more about our Whole House Filter. Beyond Healthy, Beyond Safe, It’s Ultra Pure! Under counter water filters “polish” or cleanse your water by reducing the amount of rust and sediment, odors and chlorine, lead, bacteria, and volatile organic compounds (VOCs) including pesticides like linden and herbicides like atrazine. An under counter water filter in your home will provide you with great tasting water for drinking, cooking, and making beverages like coffee, tea and juices. Throughout the first filtration stage, tap or well water passes through a sediment filter where silt, sediment and particles (like sand and clay) are removed. Then in the second stage, water is forced through a high efficiency solid carbon block filter where 10 micro-pulverized carbon efficiently absorbs chlorine, chloramines, pesticides and other harmful organic chemicals and pollutants. This pre-filtered water is now cleaned of membrane-damaging particles and chemicals. These stages protect the RO (reverse osmosis) membrane from harmful damage. For most areas of the world, RO (reverse osmosis) is the only reasonable option for water treatment. It is a continuous self-cleaning ultra-filtration system. ROs remove up to 95% of undesirable water contaminants and total dissolved solids allowing only the clean water to pass. Only the highest quality RO membranes have been individually tested and selected for the 2 Pure H2O Water System, these membranes usually last 2 to 5 years. The pre-filtered water passes through a thin film reverse osmosis membrane module where pure water molecules are separated, leaving salts, hardness, bacteria, viruses, pyrogens and other impurities isolated and available for flushing from the system. Afterwards the cleaned water goes thru the RO membrane, and then passes into an under-the-counter 2.5-gallon pressurized storage tank. This tank usually fills in 1 to 2 hours. The quality of your product water in other single purification reverse osmosis systems depends on the age and quality of the RO membrane. Lower quality membranes can remove up to 95% when new but weakens quickly over time, requiring replacement up to every year. Deionization is a method used most often by laboratories to produce purified water on demand. All naturally occurring water contains dissolved mineral salts. In solution, salts separate into positively charged cations and negatively charged anions. Deionization can reduce the amounts of these ions to very low levels (up to a 90% removal of the remaining 5% left from reverse osmosis), through the process of ion exchange. Cations are removed by cation exchange resin. It replaces sodium, calcium, magnesium, and other cations with hydrogen ions (H+). Two general types of anion resin are used for deionization: weak base resin and strong base resin. Weak base resin adsorbs strong acids, while strong base resin exchanges chloride, sulfate and alkaline anions for hydroxide ions (OH-). The hydrogen ions from the cation exchange process combine with the hydroxide ions anion exchange process to form water (HOH or H2O). In a mixed bed deionizer, cation and anion resins are thoroughly mixed in a single cartridge. The mixed resins act like a series of alternating cation and anion exchange cartridges to produce very high quality water. A mixed-bed deionizer typically removes 90% of the remaining total dissolved solids. A UV lamp purifier should be installed in every home to provide safe drinking water. This is a must for rural homes or cities where water quality is questionable. Ultraviolet (UV) Lamps disinfect water for residential and commercial applications. UV light disinfection systems will protect you from harmful bacteria (e-Coli), virus, and parasitic cysts (cryptosporidium and giardia-lambia – beaver fever) that have been found in drinking water. Chlorination of municipal water is not sufficient to kill cysts. Many communities and private homes draw surface water from lakes, streams, reservoirs, or wells that are open to pollution from natural, agricultural and industrial sources. Ultraviolet lamps create light at 254 NM wavelength; this wavelength penetrates the micro organisms found in water and damages the DNA of the bacteria and virus to prevent replication and renders the organism inactive (all bacteria, virus, moulds, algae, and yeast). Usually UV systems are installed on the inlet pipe to your home killing bacteria and viruses from your incoming water line. 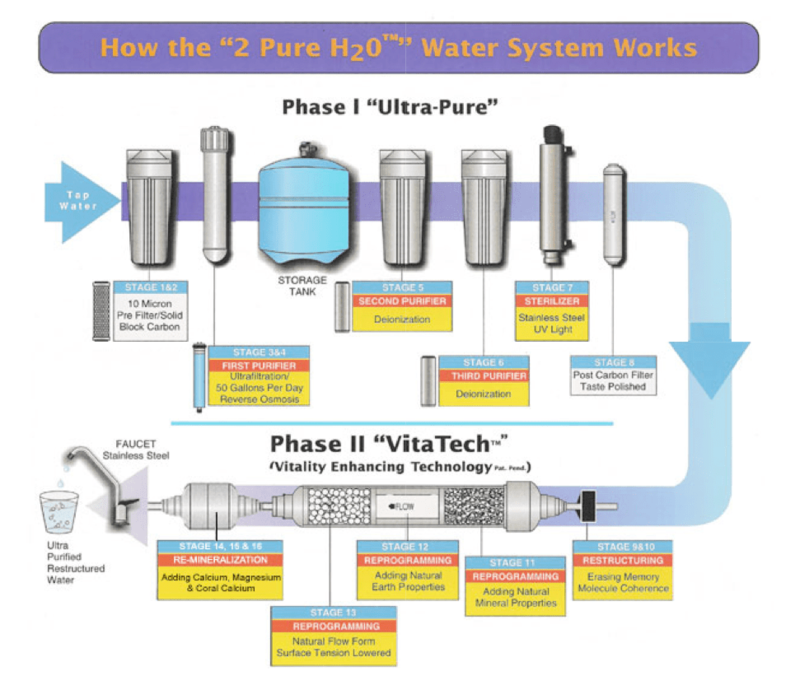 The 2 Pure H2O Water System pre-filters the water before it reaches the UV system. The reduction levels are 99.99% in properly sized systems. The UV unit does not add any chemicals or by-products to the water. The UV unit uses 25 to 65 watts of power, the same as a light bulb. It plugs into a wall outlet. It is better to leave the unit on all the time; the lamp is rated for 1 year of continuous use. The unit has an alarm to warn of failure. An optional solenoid valve will prevent water flow in case of power failure. With the 2 Pure H2O Water System, cleaning of calcium and iron deposit from the UV lamp is not required. Calcium and iron do not build up on the UV lamp because of the pre-filtration of the water prior to reaching the lamp. The frequency of cleaning for the 2 Pure H2O Pure Water System depends on the quality of water entering your home. We recommend inspection at least every 6 months. The UV light is resistant to damage by brownouts and voltage fluctuations. It will withstand a range of 90 – 265 volts and still operate properly. Helps to reduce particles and prevent possible damage to water-tight seals in faucets and appliances, therefore cutting down on maintenance costs. The Post Carbon Filter uses an activated medium with hundreds of thousands of square feet of absorption area, which helps to improve the taste and odor. From physics, we know that everything is vibration. Every material reacts on certain frequencies more or less strongly. Ideal vibrations create impulses, which, under defined circumstances, start a chain reaction (of vibrations) with increasing force. Water is changeable; it is able to absorb, transfer and release information in its structure. Therefore, even after physical purification, water still often carries unhealthy electromagnetic frequencies from poisonous substances. In the last stages of water purification, 2 Pure H2O technology will erase unwanted frequencies, and reprogram the water to copy that of nature. A triangular shape magnet is held in a steel casing. Each side of the triangle is a 12,000 Goss NdFeB (Neodymium) magnet. At the center point of the triangle where the magnetic energy surrounds the water as it flows through this section, there is a 36,000 Goss energy touching the tube where the water comes through. A magnetic field has a defined effect on the passing water. It influences the ions within the water to enhance ion exchange that will improve the oxygen utilization of the water. Most importantly we can imagine the effect of the O2-Pure technology with its ability to erase unwanted frequencies. Yes, as humans we need the right kind of frequencies. This brings us to the next step in the 2 Pure H2O technology. When the water flows over the rocks (74 minerals), the previous memory is erased. The 74 minerals then provide new frequencies. The water molecules are shaken by the special field in a way that, for a short time, the clusters and the hydrogen bridges are broken up. At the same time, the water is carried forward in an s-pattern movement, identical to that of water in nature. It is the frequencies of these minerals (that are released into the water) that make the change, and not the minerals themselves. Far-infrared energy is sometimes called “the wavelength of life” which causes the water molecules in the body to vibrate. When the water flow is channeled through natural far-infrared honeycomb shaped ceramic materials, the water is imprinted with the far-infrared frequencies. At the same time, the water is brought in a movement (s-pattern), which is copied by nature. When the water flows moves through the ceramic far-infrared balls (also containing minerals) it creates an “S” shape configuration (pattern) that mimics and energizes the water (like free flow form water). The surface tension is reduced, improving the biological permeability and hydration properties. Calcium, magnesium, and coral calcium are now added to the water stream to add a small amount of minerals to balance the water. The effect of these special minerals is to help balance the pH and energize the water, giving it more electrons. The 2 Pure H2O Water System combines a number of simple and highly sophisticated technologies, along with precision filters to remove impurities. Some stages remove contaminants more effectively than most conventional filters. Other components of the system energize and re-mineralize the water, using Vitality Enhancing Technology to provide sparkling clear, great-tasting water. One of the basics of good health is a daily intake of clean water. It’s simple. It’s convenient. And it can have a major impact. Now it’s possible to have a source of water that is chemically and energetically ready to support your health, right in your home. Quality housings, filters, and durable mounting frames ensure years of dependable service. Installation by a professional plumber required. Depending on your household needs, look at our whole house carefree chlorine removal system. Q. Why is the 2 Pure H2O Water System so special? This 16-stage reverse osmosis, developed by Dennis Higgins of Environmental Technology, uses three purifiers, rather than just one, and has a one of a kind membrane that filters beyond any other filter on the market. It also incorporates ultra-violet sterilization to ensure the water is of the purest quality. Our UV lamp is composed of a stainless steel and quartz glass housing (no plastic). While the first seven stages (Ultra-Pure) of the unit create incredibly pure water, the next nine stages (Vita Tech) restructure the water by enhancing its ionic minerals and alkalinity. We believe this water is the purest water available through reverse osmosis. We have been distributing the 2 Pure H2O Water System since 2002 with great pride. Q. Can I buy a whole house filtration system that will create pure drinking water? A. Despite a lot of claims, there is no whole house water filtration system on the market that creates pure drinking-quality water. Our whole house chloramine filter system removes chlorine, chloramines, VOCs, and pesticide-like chemicals, producing great bathing and gardening water. But to say that a whole house system can do more than this, short of a whole-house RO, is misleading. In order to have purified drinking water throughout the house from every faucet, a whole house RO system would be needed. This would cost around $10,000 or more, depending upon the house, and would require extensive re-plumbing. We highly recommend our very dense carbon whole house chloramine filter for removing chlorine, chloramine, VOCs and pesticide chemicals from your entire house. Pricing varies depending upon the size of your water line. Please call us for a quote at 858.259.6000. Q. Can I use a water softener with the 2 Pure H2O Water System? A. Yes, water softeners will reduce build up and scaling, which will extend the life of your water heater, water pipes, fixtures and appliances. Using a water softener in combination with the 2 Pure H2O Water System will extend the life of the RO membrane. Q. If you have hard water and no water softener, can you still use the 2 Pure H2O Water System? A. Yes, but it is preferred that you use a water softener. Hard water is more than a nuisance. It is costly too. Hard water contains calcium, magnesium and iron, which build up inside your water heater, water pipes, fixtures and appliances. The 2 Pure H2O Water System provides the highest quality RO membrane in order to provide the best (rejection) quality of water for the longest period of time. Hard water will shorten the life of the membrane and therefore will require replacing more often. Ask us about our potassium soft water conditioning unit for water softening. Q. How does the water from the 2 Pure H2O Water System taste? A. With the 2 Pure H2O Water System, the taste is like natural spring water, with a nice light mineral taste that refreshes your thirst. Stages 8 through 16 enhance the mineral properties of the water and improve the surface tension, and biological availability. The result is a refreshing taste and exceptionally hydrating. Q. Is the 2 Pure H2O Water System difficult to install? Q. Is the 2 Pure H2O Water System easy to uninstall should I move? Q. What size is the holding tank? A. The standard tank that is included in the price is a 4-gallon tank, which holds approximately 3 gallons and is 16″ high x 11″ diameter. 9-gallon tank: holds approximately 7 gallons; dimensions: 19″ high (21″ with top fitting) x 13″ diameter. Q. If the area under my sink is too small, what can be done? A. The 2 Pure H2O Water System can be placed in an adjacent cabinet next to the sink. This would necessitate the drilling of a small hole between the cabinets for the tubing. Other options are available requiring the running of tubing from a utility room or basement. Please call us to discuss details. Q. Does the water come out of the kitchen faucet or a special spigot? A. A special copper and lead-free spigot designed for ultra-pure water is included with the 2 Pure H2O Water System, so your drinking water will not interface at all with your existing plumbing. A chrome spigot comes standard with the unit but other finishes are available for purchase to match the finish of your fixtures if other than chrome. It is important that only our copper and lead-free spigots are used with this ultra-pure water. Q. Can I have purified water in other areas of my house or office, in addition to the kitchen sink? A. This purified water can be delivered to other areas of the house or office by running dedicated tubing from the unit to the desired location. Additional copper and lead-free spigots will be required. A. A TDS (Total Dissolved Solids) meter is included with your unit so you can test your filter efficiency. Based on TDS readings, our customers change filters approximately every 12 to 24 months depending on water usage, purity and hardness. Filters should be changed every two years at a minimum. Additionally, the membrane will need to be replaced every hour years. The process of testing your filters is very simple, taking only about 5 minutes a few times a year. A. The average yearly maintenance cost is about $180 ($15 per month) for households changing the filters every 12 months. Water usage varies from household to household with lower usage changing filters less frequently. A. Filter changes are pretty straightforward allowing and many customers opt to change the filters themselves. Some people choose a plumber for convenience’s sake. Q. How do I know when to change filters? More questions? Just give us a call at 858.259.6000 or email us below. And if you are interested in learning about the Berkey® Purification Systems, the most powerful free-standing, portable, gravity-fed water filtration and purification system, click here.